Towards the end of your academic career, you will be required to write your own capstone project. If you want to ensure the success of your project, it is important that you come up with the unique and innovative approach. You can trust this to our capstone projects service. Do not be afraid to explore various areas to create original DNP capstone ideas that will help you contribute something relevant to your field. In writing your capstone project, it is crucial that you stay ahead of the top and this is only possible when you develop pioneering solutions to common medical issues. There are available resources online that can help you create better ideas for your capstone project. Remember that this is a great opportunity for you to contribute to the development of your chosen field and you should make the most of this chance. Clinical utility of a cardiac skills checklist for teens. Mental health referral practices in a Family medicine clinic. Dementia caregiver website preliminary content. Use of Nurse case managers in Diabetic care. Overview of telehealth, telemedicine, telenursing. Diabetes management of underserved populations. Program for patients with coronary heart disease to stop smoking. Reduction in discomfort for bone marrow transplant patients. Improvement in patient flow through emergency department. Standard process for assessment of patients who may be a danger to themselves. Promotion of nutrition in the community. Prevention of meningococcal meningitis in college. Improvements to asthma protocols in college. Predictive methods for avoiding preeclampsia. Once you have selected the right DNP capstone ideas for your project and conducted your research you will need to get your paper written up. You should always carefully check with your program exactly how they want to see your capstone structured and written to ensure that you follow their requirements. Each program will have very specific requirements and they should be followed with great care. In general, the paper will follow the structure detailed here and in order to simplify the understanding of it, we have prepared for you examples of nursing capstone project. Title Page: this page will be carefully formatted according to the program that you are following. In most cases it will include your name and the program name as well as the title for your project. Abstract: This is a brief summary of your whole paper that cover every section of your paper. Usually you will write this part of your paper last of all. Introduction: set the stage for your paper by stating what the problem is that your paper will solve and provide some background to the issue. Problem description: provide an in depth description of the issue that you will be solving as well as stating your specific project goals and the scope of your investigation. Review of Literature: this provides a synthesis of the current knowledge around your issue. Usually it will take a broad look at your topic area and then focus in on your specific issue. Methodology: describe how you conducted your research and the way you analyzed your data. This section needs to contain sufficient detail for another to be able to replicate what you have done. Discussion and conclusions: this section will detail out your findings and show how they relate to the aims of your project. It should let the reader know why your findings are important, what you have learned, and any limitations to those conclusions. References: you are required to provide a list of all of the sources that you used when making your paper. The list must be written using the correct academic style for your paper. Appendices: this section contains any other relevant information that is required for you paper that has not been included within the main part of your writing. This can include things such as tables of data or copies of questionnaires. 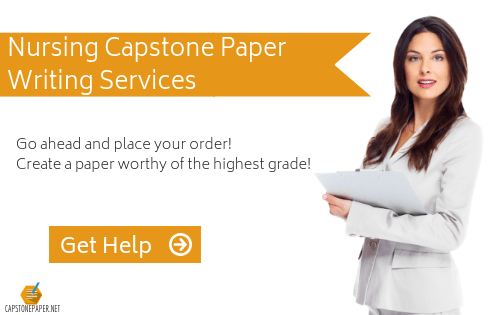 How Can You Work with Our DNP Capstone Paper Writer? If you are having difficulties with coming up with original ideas for your process of writing capstone project, make sure that you get expert help. One of the advantages of online services is that you can easily receive premium academic assistance without leaving the comforts of your own homes. Consultants and writers are available 24/7 to give you the best DNP capstone ideas. Complete the order form: fill out each of the fields on our form which can be accessed from anywhere in the world 24/7. Pay for your requested service: we provide our help at some of the most competitive prices you will find online. All payments are made securely using either a credit card or through PayPal. Discuss with your specialist: we will select a fully qualified member of our team who will work directly with you to ensure that your paper is written exactly as you require it. Request any changes: on completion of your capstone you will be able to ask for an unlimited number of revisions to the writing until you are totally satisfied with the final outcome. Take delivery of your DNP capstone paper: it will be carefully proofread and a plagiarism report generated to confirm that it is unique to you. Ensure that you select the perfect DNP capstone ideas for your paper and complete your writing to perfection with the support of our experts!